The Hikurangi Plateau is currently subducting beneath the east coast of the North Island. The Plateau is large at about 0.4 million square kilometers or 3.5 times the size of New Zealand’s North Island. If you include the subducted part, known from seismic imaging, the total area is 0.8 million square kilometers. To put that size into context that is slightly bigger than the whole of Pakistan. The Plateau is composed of a basalt like normal oceanic crust, but at approximately 20 km thick it is three times thicker than normal oceanic crust. 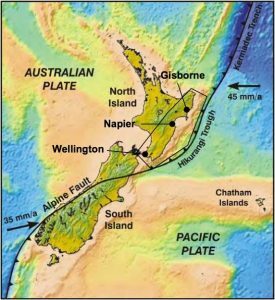 The huge thickness of the Hikurangi Plateau makes it buoyant – it stands a remarkable two to three kilometers above normal old oceanic crust and is pushing the east coast of the North Island up even as it is pulled down the subduction zone. 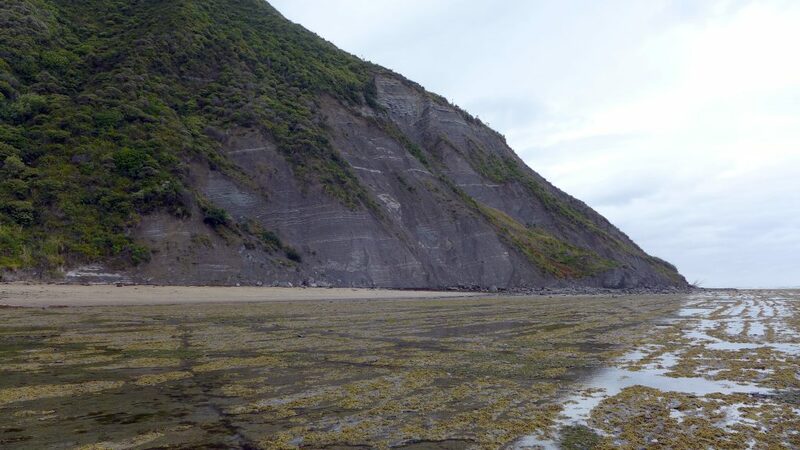 The upward motion of the east coast, from local faulting and regional uplift, forms the beautiful marine terraces where old seashells can be found well above sea level. 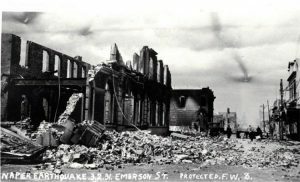 But faults in the region also generate earthquakes such as the 7.8 Mw 1931 Hawke’s Bay earthquake which killed 256 people. In this region of the margin the Hikurangi Plateau is subducting at a rate of about 5 cm per year which is pretty fast for a tectonic plate. The Hikurangi Plateau is part of a class of geologic structures called large igneous provinces or LIPs. These provinces represent massive volcanic events on a scale unknown in the recent past. The volume of the Hikurangi Plateau is about 16 million cubic kilometers and is thought to have formed over a geologically brief time. The volcanic rocks of both the Hikurangi and Manihiki plateaus are geochemically similar to the much larger Ontong-Java Plateau. This similarity suggests that all these plateaus may have formed on super-plateau. At about 80 Million years ago in the late Cretaceous, when dinosaurs still walked the earth, both the Hikurangi and Manihiki plateaus rifted away from the Ontong-Java Plateau. 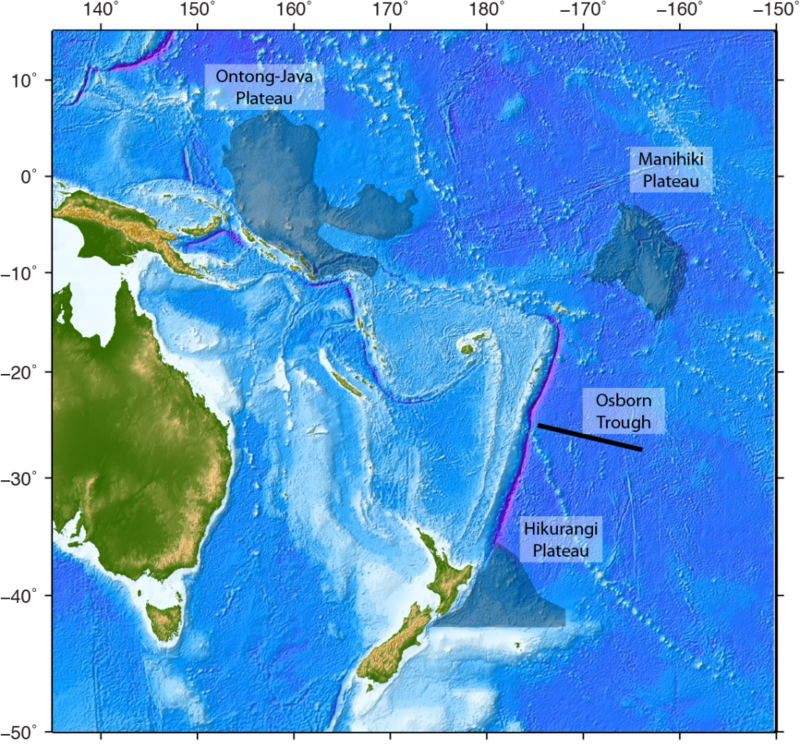 Today, the Osborne paleo-spreading center separates these plateaus with the Hikurangi Plateau on the southward limb of this system and the Manihiki Plateau on the northward limb. Large Igneous Provinces constitute a mystery reminding us that we don’t always understand how the Earth works. What we do know is that LIPs were formed through massive outpourings of magma over a relatively short period of time about 120 million years ago. These provinces do not seem to fit within the theory of plate tectonics that says plates are rigid and only deform at their edges. Like the Ontong-Java Plateau, the Hikurangi Plateau may have erupted on 15 to 30 million year old seafloor, well away from a plate margin. Scientists are curious about how these provinces formed and what impact they have on the environment during formation. Did this volcanism result from a giant magma plume rising up from deep in the Earth’s interior before impinging on the Earth’s surface, from a meteorite impact, or from an event in which the lower crust delaminates from the Earth’s surface, sinks, and hot mantle material rushes up to fill the void? When the Plateau formed, did the massive outpouring of magma disrupt ecosystems, did it change ocean circulation, did it change the chemistry of the atmosphere or ocean? We are only scratching the surface of this large plateau and there is much to be learned about how our world works from studying these dramatic features.